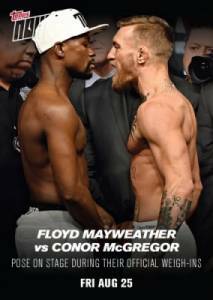 2017 Topps Now Mayweather vs. McGregor brings the fight action home with a small amount of exclusive choices from the on-demand brand. Extra options include bonus cards for those who bought the initial Floyd Mayweather card, and even autographs. 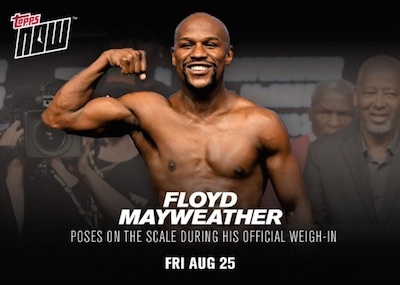 Listed through the Topps Online Store with their Now UFC releases, Topps issued several cards under the Now banner that chronicle the mega-fight between Floyd Mayweather and Conor McGregor. The individual fighters in the Weigh-In set act as "instant win" cards should the depicted subject prevail. In this case, the prize is a free card for those that purchased the Mayweather card, which finished with 513 copies, besting McGregor's 461. A third card highlighting both fighters sold 301 copies. The second installment of 2017 Topps Now Mayweather vs. McGregor covers the actual fight with another card for each fighter. In addition, multiple signed options exist for Mayweather. The on-card autographs are limited to 49 copies or less. 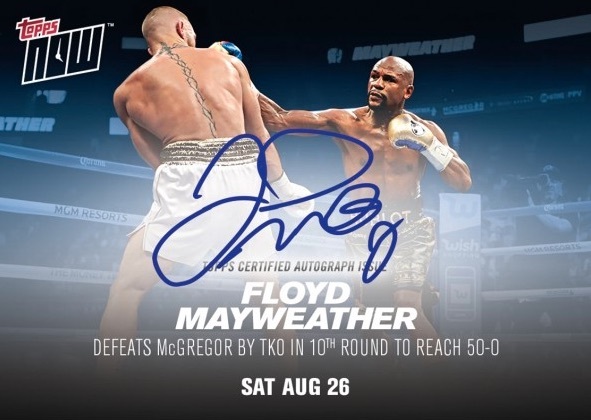 Although the standard cards in 2017 Topps Now Mayweather vs. McGregor keep to the customary $9.99 format, the 2017 Topps Now Floyd Mayweather autographs are much more expensive. Prices start at $749.99 for the Blue version with 49 copies, and go up to $4,999.99 for the one-of-one Gold parallel. Topps also showcased their pre-fight excitement with the 2017 Topps On Demand Mayweather vs McGregor: Road to August 26th set. Event date for each card is noted. Print runs (PR) added when known. Shop for available Now cards on Topps. Those that bought the Maywaeather "Weigh-in" earn a bonus card. Main Event - 08/26/2017 - Shop on Topps. Road To Mayweather vs McGregor SEALED Topps On Demand Set of 20 Trading Cards.